I went back to my home church this last Sunday. I have stopped attending as often as I used to because it's such a far drive. I have attended some other churches nearby but some Sundays, I just like to sleep in. It felt good to be back in a familiar environment and to have everyone greet me and ask how I was doing and that they missed me. A lot of things are going through my head nowadays but I wasn't quite prepared for the sermon to touch me in a particular area. He preached on a few things but the one that stuck out to me was forgiveness. One of the quotes he mentioned is often said to have come from Mother Teresa but I've heard claims that that is not really true. Even still, it's very touching. I am familiar with this quote and have it on my facebook but the first line still rang true especially on that day. He also told a short little story that was touching. Two friends were walking through the desert. During some point of the journey they had an argument, and one friend slapped the other one in the face. By then, I couldn't hold back the tears anymore. What does forgiveness have to do with me, you might ask? My parents. It's been a long two years and while my life has been very happy, there have always been points where I have felt deeply saddened that both of my parents no longer desire to be in my life. I tell people often that it has been easily the hardest part of my transition. I've cried many nights over them and even now, though thoughts of them don't enter my mind as much in daily life, they still exist. Their actions are out of my control and yet there is something that still is in my control and that is forgiveness. I cried in church that day because I feel so hurt by them and I cling to that hurt so tightly....that I don't want to let go of it. The idea of forgiving my parents for hurting me like they have is overwhelmingly difficult to process. Part of it is that I know by forgiving them, it does not mean they will change their ways or opinion of me and I will most definitely still be hurt by them in the future. But as the quote said, I really need to 'forgive them anyway' knowing full well that it was never between us really. It's something I need to do for me. I have spent a lot of time and energy in expressing my hurt over my parents. I've blogged about it, video-logged about it, and talked with friends about it. I've imprinted it on many people's minds. In that way, I have written it on the stone instead of the sand. In fact, I've made it so personal that I've written it on my heart...in blood. And I need to let go. I need to wipe the slate clean, even if it is to only be filled up again. I need to do this for me, not them. Holding onto the hurt, the grudge against them and their actions, is only eating me up inside and adding negative energy to my life, even if subtly. So on this day, Mom and Dad, I forgive you. Excellent post! 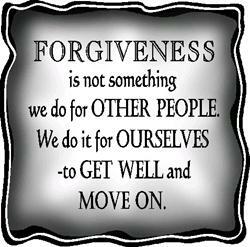 Forgiveness is a huge key to our own spiritual freedom! Thank you for being so transparent - I know it can't be easy. I have been struggling with this very same issue. (My parents wrote me letters shortly after I told them I was transitioning to let me know that they would never talk to, or see me again as long as I was Jennifer.) I am in tears right now... thank you. I have been praying for you and your parents every day since knowing your situation. I pray that the Holy Spirit will convict your parents of their need to leave all their own hurt behind them and embrace you as the daughter and child they have always had. You have always been so up front and honest. Stay this way and it will carry you through your life, along with your walk with Jesus. This is really beautiful. You are so inspiring to me girl, I am glad to call you friend. I too forgive your parents and mine. I am glad to see you have reached this point. It is such a powerful and life-changing realization when you come to understand complete forgiveness. Even though I am not a person of faith, it doesn't take religion to understand the healing power of patience, forgiveness, and compassion. So in all the best ways, I am incredibly proud of you. 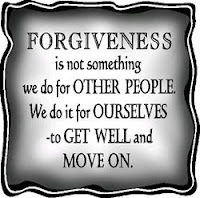 :) I know just how hard it is to forgive like that for the first time.